I have seen only four of Puppetmongers many shows, but Bed & Breakfast from 1985, now remounted for a short run in Toronto, looks very much like a masterpiece. Puppetmongers, siblings Ann and David Powell, have used many forms of puppetry in their shows from tabletop bunraku to object manipulation. The special feature of the utterly delightful Bed & Breakfast is its use of seven-inch-tall figures in a large four-storey-tall Edwardian dollhouse. To see the inhabitants of an intricately decorated dollhouse come to life will entrance any child over 5, but the Puppetmonogers’ dry wit and the subversive nature of the story will also amuse their accompanying parents just as much. Bed & Breakfast is a retelling of Hans Christian Andersen’s 1835 fairy tale “The Princess and the Pea”. Puppetmongers have transferred the action to Edwardian times and have made some significant alterations to the story. In the Puppetmongers version, Prince Cuthbert’s indomitable mother Queen Daphne is becoming increasingly irritated that her son refuses to marry any of the eligible princesses that she introduces to him. One day in the conservatory she discovers the reason why. Cuthbert shares a love for entomology with one of the serving maids, Amy, and asks her to marry him. The Queen overhears and puts an instant stop to that. She fires Amy on the spot and sends Cuthbert on a round-the-world travel adventure so that he will forget Amy and come to his senses. One night about a year later during a terrible storm, a young woman named Amelia shows up at the front door of Poshingham Palace. The Queen offers her shelter and because of Amelia’s demeanour begins to wonder if she may actually be a princess. To test this she has Amelia sleep on a bed piled high with mattresses under which she place one pea. It is well known that real princesses are so delicate that they can feel such a small object through all those mattresses and thus will not sleep well. Meanwhile, the large serving staff at the Palace comes to believe that the stranger is none other than Amy and does what it can to help the young woman pass the test. The show begins with Ann Powell dressed in costume as Mrs. Powell the head housekeeper and David Powell as George the Palace’s odd-job man. The two use a family tree to explain the relation of Cuthbert to his parent and another tree diagram to explain the hierarchy of servants who work below stairs. For adults in 1985 the main reference for master-servant relations would have been the television series Upstairs, Downstairs (1971-75). Now it is impossible to watch Bed & Breakfast and not think of Downton Abbey. 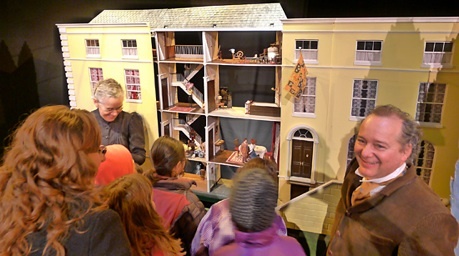 The main feature of the show is the four-storey dollhouse with a front that splits into two that can reveal one half of the house at a time, only the stairs and landings or the entire house. Ann Powell is responsible for the incredibly detailed house and its furnishing and the exquisitely outfitted bendable dolls that inhabit it. Puppetmongers are known as pioneers in object manipulation and that is basically the style used in Bed & Breakfast. Except for a rod puppet representing a caterpillar that Amy and Cuthbert both admire, al the “puppetry” consists of the Puppetmongers handling the dolls and moving them from place to place within the dollhouse. Ann Powell interacts with the dolls in her full human form as Mrs. Powell, while David Powell interacts with the dolls sometimes through his similarly clad doll in the house or in his full human form. When the doll George is asked to bring in some wood and the human George goes out and brings real wood in from the audience, it is as if we are seeing the doll figure in close-up. The absolute charm in Puppetmongers’ style of puppetry in Bed & Breakfast is that it is exactly like the way that children play with dolls in a dollhouse, except that here they have a fully scripted story to enact. The dollhouse is surrounded by drapery that creates a kind of proscenium around the house. The wide side panels come to have more significance that we first realize. Frequently throughout the action a character, most likely Amelia or the Queen, will ask herself, “I wonder what Cuthbert is doing now?” whereupon on one or the other of the panels a black-and-white slideshow will illustrate what Cuthbert is doing with David Powell voicing the unflappable Cuthbert. Cuthbert does travel all over the world – from Egypt to Java, from Antarctica to the Arctic and across Canada by train. Rather like Bertie Wooster without his Jeeves, Cuthbert blithely gets himself into one dangerous situation after another. Far from weaning him from Amy, everything he sees makes him think of her and sigh “Oh, Amy!” Children will like the humorous drawing. Adults will enjoys Cuthbert’s twittish commentary and note such points that Cuthbert has bought land right near the erupting Krakatoa volcano and that the ship he hails for rescue from an iceberg in the Arctic is the Titanic. Ann Powell is a master of distinct voices for the many characters from the imperious Lady Bracknell-like Queen, to the lower-class servants to the deliberately incomprehensible King. Since the visiting Amelia (or is it Amy?) has a very sound sleep in spite of the pea, Puppetmongers provide a very clever twist at the end, an insight credited to the King, that still leads the story to a happy ending while cleverly subverting the point of the original story. This hour of wit and whimsy is one of the most joyous and unified of Puppetmongers’ shows. It is Puppetmongers’ 25th Winter Holiday production and part of their 40th anniversary season. It is a wonderful way to celebrate this ever-inventive company and to celebrate the idea Puppetmongers promote that adults, too, can share a childlike sense of wonder with their children. Photos: (from top) The cast of Bed & Breakfast, ©Dahlia Katz; Ann Powell in grey and David Powell in brown showing Poshingham Palace to the audience, ©2011 Christopher Jones.